This is what summer, a super-sized jolly jumper* and $10 can do for a pre-schooler. Pardon the quality of the photo, it was taken with Mr Oh Waily’s Blackberry. * for Wellingtonians with some spare dollars and a stomach for bouncing, laughing children, this joy device can be found at Frank Kitts Park. ** Oh Waily family members (and any other interested, but non-creepy parties) feel free to request scruffy video if keen to see lots of sky with blurs of child scattered throughout. 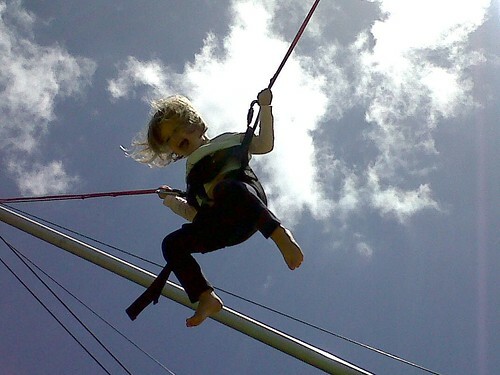 Be prepared for calls of “Higher Daddy, Higher!” Not for the squeamish about heights and small children.